Syracuse/Binghamton, New York (July 19, 2017) – Howard Hanna Real Estate Services is now the #1 real estate company in New York state as of July 18, creating market dominance and brand uniformity under one name. 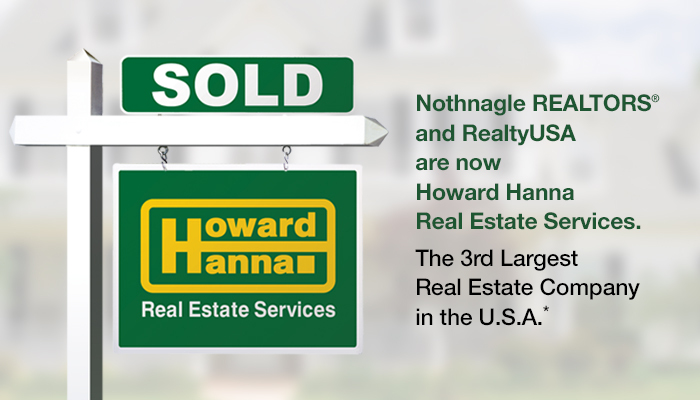 Nothnagle Realtors and RealtyUSA, who both merged with Howard Hanna in the past two years, have changed their names across the region. The strategic decision of the three family-owned and operated companies to partner together has produced a strong, viable company with more than 3,000 agents and employees in 101 offices across New York state, and a 32% market share of homes sold. Howard Hanna Real Estate Services is also the third largest real estate company in the United States with more than 9,000 agents and employees across the eight states of NY, PA, OH, VA, MI, WV, NC and MD. Last year, the company recorded 95,152 closed transactions. Beginning immediately, the Howard Hanna brand will appear on signs, advertising and marketing materials throughout the region. Visitors to the Nothnagle Realtors and RealtyUSA websites will be redirected to HowardHanna.com, where listings will instantly have a greater reach, as the Howard Hanna website had 15,895,478 visits in 2016. In Pennsylvania and Ohio, Howard Hanna has a long legacy of vibrant green and gold colors, white post yard signs, and branded marketing. “We look forward to that same success in our New York markets. We are recognized as the most professional real estate brokerage in every market we serve. Adding Nothnagle and RealtyUSA only makes the Howard Hanna brand stronger,” added Hanna. “Establishing brand consistency is about more than just putting a logo on buildings and for sale signs. It is about being compatible and credible. The attributes of Howard Hanna, RealtyUSA and Nothnagle are interlinked, and we are all working together for the best interests of our clients. There is a high level of loyalty and longevity among management, agents, employees and clients that will allow for continued growth. We are all moving forward together,” said Armand D’Alfonso, former owner of Nothnagle Realtors and now President of Howard Hanna New York. Last year, Howard Hanna launched a new corporate tagline, “Home Happens Here,” which communicates the company’s desire to help make the dream of home ownership a reality. “With the Hanna brand name on all 101 New York offices, we want to be known for an extraordinary combination of agents, services and products, with experience to back it up,” said Hanna. Howard Hanna Real Estate Services is the 3rd largest real estate company in America, the #1 privately owned broker in the nation, and the largest home seller in New York, Pennsylvania, and Ohio. The family-owned and operated real estate company specializes in residential and commercial brokerage service, mortgages, closing and title insurance, land development, appraisal services, insurance services, corporate relocation and property management. With 259 offices across NY, PA, OH, VA, MI, WV, NC and MD, our more than 9,000 sales associates and staff are guided by a spirit of integrity in all aspects of the real estate process. Applause Applause Applause! A WHOLE LOTTAH “AWESOME SAUCE” on this one!… And, I especially love the word 🙂 GLOBALLY 🙂 Hanna World, “One Stop Shopping Virtually In the House!”.